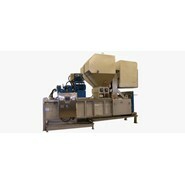 The X3Cycler is the answer for processing large volumes of full plastic or aluminum liquid containers. It dumps, perforates, dewaters, crushes, and bales in one compact and integrated system. Large 35 cubic foot bales, high thru-put and corrosion resistant stainless steel construction.